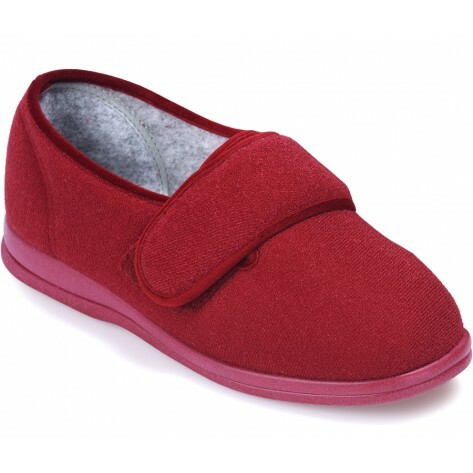 Cosy Feet Ladies Holly Seam Free Snug Slipper. An updated version of our Helen style, this supportive slipper now has a cushioned footbed for even greater comfort. The broader toe-shape has more space for swelling and it’s seam-free at the front for sensitive toes. The touch-fastening strap adjusts to fit a range of swelling..
Mum loves these!! These slippers are smooth across the toes with no stitching to rub on sore toes or delicate skin. She loves the pink pattern too - really cosy and comfortable slippers. purchased for my elderly mum. very good fit, shape and style, light but sturdy, velcro fastener makes all the difference. would definitely but again and would be happy to recommend. Excellent service and very reasonable price for slippers with no delivery charge. Excellent quality, comfortable slipper, Clear website and efficient service. Best price too. Mum no longers creases the heals as she can easily put these on with the velcro. Bought these for my mum. She is very pleased and says they are the most comfortable slippers she has ever had. This company gives first class service throughout.